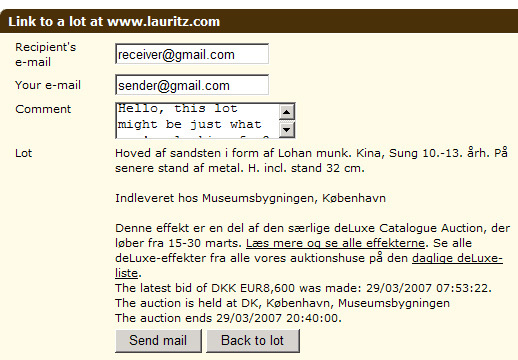 If you know the lot number, this can be written in the search field on the 'Homepage' or under 'Auctions'. If you find it difficult to keep track of the large number of lots on Lauritz.com, as a user you can set up a Lot search under My page (see the illustration below). Then you will receive an e-mail each time Lot search finds a new lot which fulfils your search criteria. Lot search is updated each night. You can also set up Lot search by clicking on 'Create Lot search' under Auctions.